Google Book Search has rolled out a novel mashup of books and maps. This is one of those brilliantly simple examples of how digitized books can add value to the user experience. 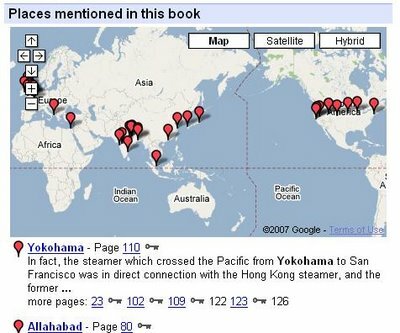 You can now see the locations mentioned in quite a few books pinned onto a world map. While many Google fans have created their own mashups of Google services, this is one of the few times that Google has created one of its own. Books like Around the World in Eighty Days (of course), The Travels of Marco Polo, and even The 9/11 Commission Report have been mapped.